We have added Buffalo, New York, to our list of cities for Great Lakes Cuisine and included two iconic locations: Anchor Bar and Charlie the Butcher. Anchor Bar is the original creator of Buffalo-style hot wings which is a fairly recent addition (last 50 years) to the regional culinary tradition. As a dish, it doesn’t have very deep roots – closer to in age to Chicago deep dish pizza than many of the culinary traditions we typically feature. The better example of the Great Lakes culinary tradition from Buffalo is Beef on Weck – a roast beef sandwich served on a Kummelweck roll, a hard roll with coarse sea salt and caraway seed on top. As always, Chef Sawyer takes it to another level. Incredible. In honor of the Buffalo-style hot wing, we offer our take on a Buffalo Chicken Burger, featuring both a blue cheese spread and a ghost chili pepper dusted cheese, topped with a celery relish – all the elements of the traditional hot wings, typically served with celery sticks and a blue cheese dipping sauce. We use a number of selections from Renard’s Cheese based in Door County, WI, including their remarkable Ghost Chili Jack cheese and we highly recommend ordering these cheeses online, but we have given alternatives below for convenience. In a medium sauté pan over medium high heat, melt butter, add onions, and sauté until translucent. Allow to cool and then add to ground chicken in a large bowl. Add corn flakes, herbs, and egg to the bowl and mix with hands until well mixed. Form into burgers return to refrigerator to set at least 30 minutes. Prepare grill while burgers chill. Blend all ingredients for celery relish. Toast buns, spread with butter and sprinkle with garlic salt. Set aside. Place burgers on grill, sprinkle with salt and pepper. Cook about 5 minutes per side, then top with blue cheese spread and sliced cheeses. When cheese has melted, serve on buns, topped with celery relish and lettuce. 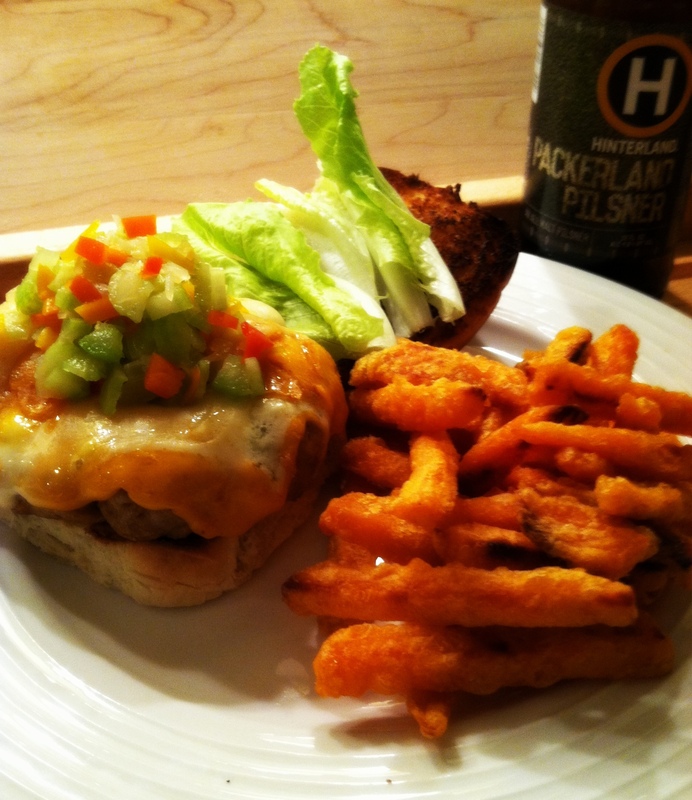 We enjoyed our Buffalo-style Chicken Burger with an ice-cold Pilsner from Hinterland Brewing and sweet potato fries. The Pilsner was a perfect complement and very refreshing between bites of the burger. 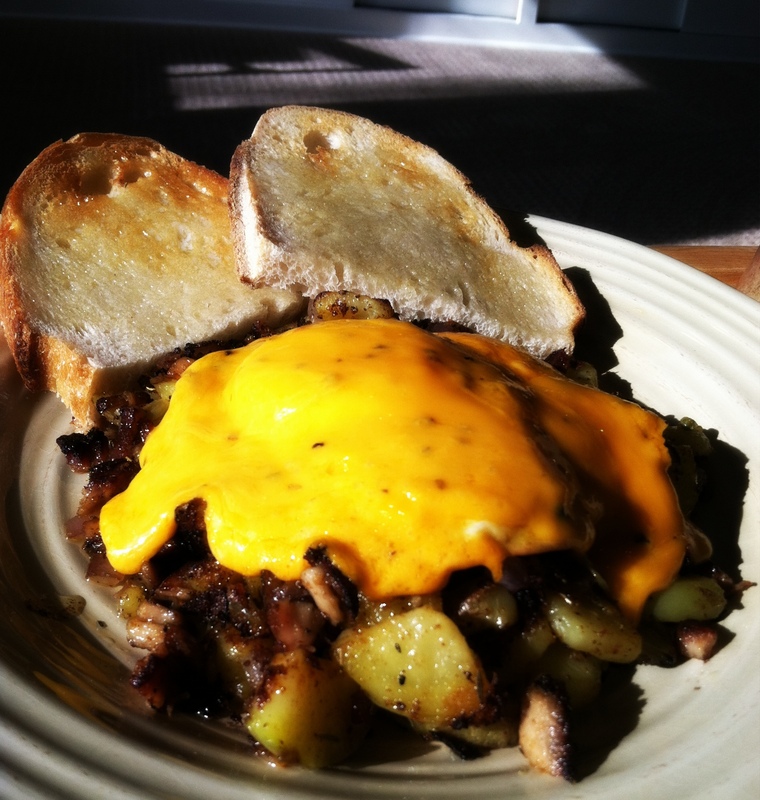 The Ghost Chili Jack cheese creates a slow burn, that builds and builds. You should get your hands on some, and enjoy the heat. We have detailed our love for Hoppel Poppel, partly due to the association with the warming, filling versions served in Milwaukee at Benji’s or Jo’s Cafe, routinely named as two of the best places in the city for an old-fashioned diner-style breakfast. But the other reason to love Hoppel Poppel is the endless variations on the theme. This is basically cured or leftover meat, par-cooked potato and/or another starchy root vegetable, onions or related additions, topped with eggs in nearly any style, and cheese. Simply fry up the diced meat, starch, onion and spices, then top with eggs and cheese. The standard is scrambled eggs, added directly to the frying ingredients to create a sort of omelette/frittata, though a soft, sunny-side up egg is a wonderful alternative. This becomes a lovely vehicle for leftover meats and we created breakfast today from our leftover shredded Porketta. In a well-seasoned cast iron pan over medium-high heat, 1 tablespoon of butter is melted, then diced porketta, diced par-cooked yellow potatoes, and diced red onions (to echo the ingredients used in the roast). Sprinkle with dried herbs (oregano, thyme, basil) and a pinch of sea salt. In a separate pan over medium heat, melt 1/2 tablespoon of butter and crack one egg and cook to runny, sunny-side up, layering on cheddar cheese about half way through cooking. We had a supply of Renard’s Cracked Black Pepper Cheddar, which added just that extra pop – hearty, rich flavors of pork with the tang of cheddar. 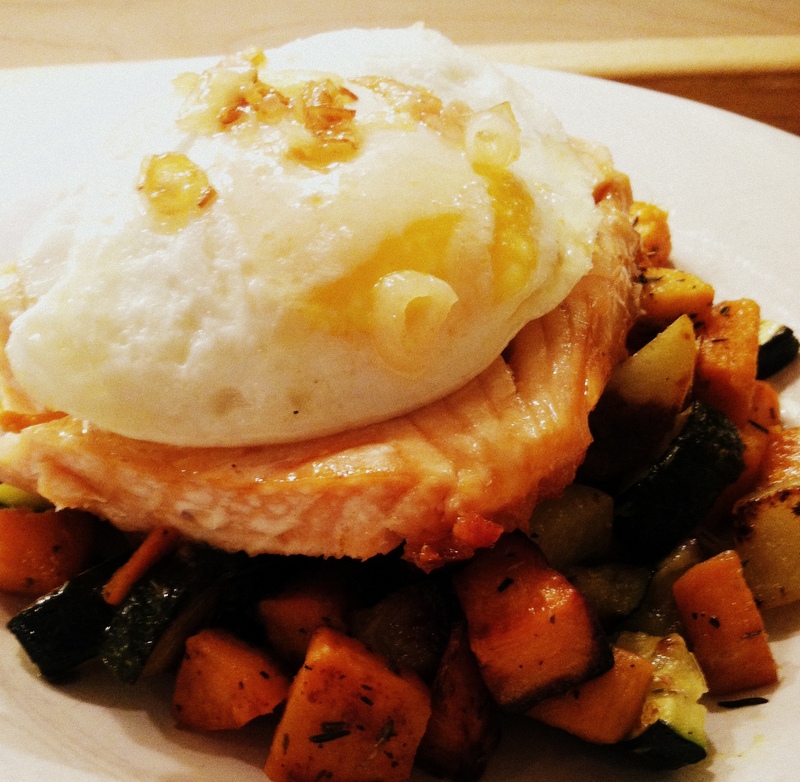 We enjoyed another variation a few nights ago for dinner, featuring salmon over a vegetable hash. Instead on pan frying the hash, in this dish we roasted diced sweet potato, diced zucchini, and diced yellow potato with a drizzle of olive oil and liberal amounts of dried thyme and sea salt in a 375 degree oven for approximately an hour. The sweet potato will become soft and begin to caramelize on the edges. While the hash cooks, heat a oven safe frying pan on the stove top over medium high heat with about 1/4 inch of vegetable oil. When oil is shimmering hot, lay a salmon fillet into the pan, skin side down and sprinkle with salt and pepper. After approximately five minutes, the fillet will have a slight browning on the edges of the skin, add two shallots diced to the pan and place the pan into the oven and allow the fish to finish cooking. While the fish finishes, cook a runny, over-easy egg. Serve with the hash on the bottom, topped with salmon fillet and then the egg. Drizzle shallot butter over the egg. The sweetness of the potatoes and zucchini were a perfect canvas for the salmon while the egg and shallots created a wonderful “sauce” with some of the same elements of a scratch-made mayonnaise, particularly with a squeeze of lemon. Lovely. Endless possibilities.